BlackBerry vs iPhone: Which is better for Business? Home Gadgets BlackBerry vs iPhone: Which is better for Business? The BlackBerry has been the queen bee in the world of the business smartphone since the race began several years ago, outstripping all other phone manufacturers. However, the trend is wavering, with more and more companies switching to the iPhone as Apple random spreads outside the realm of personal use. So, today we’re examining three key elements essential to any kind of business phone, and how both BlackBerrys and iPhones perform. Let the battle commence! Being able to email on the move is essential for about 99% of jobs. But exactly how easy is it to compose an email on these phones? 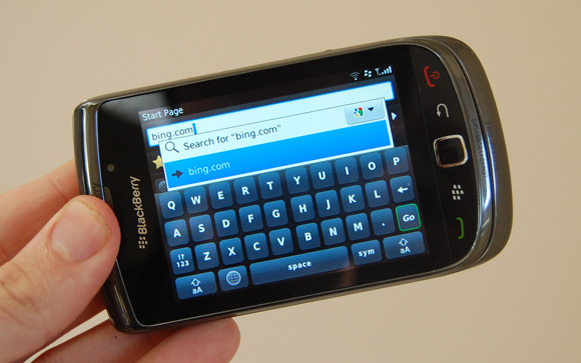 On one hand, you have BlackBerry’s unique QWERTY keyboard, which is as simple to write on as a computer (almost). You have a separate enter, space and delete key which minimizes sent before you meant to mistakes – all it’s missing is a special number pad. However, anyone who has tried using the keypad on a BlackBerry knows you either have to develop the skill to text daintily, or grow teeny-tiny fingers to use it accurately. On the other hand, the IPhone’s touch-screen means you don’t have to deal with minuscule keys, but you do have to deal with a less detailed QWERTY keyboard. Personally, I find it really difficult to type on a touchscreen, as I can never tell what letter I’m pressing and end up with incomprehensible gibberish. The solidity of a keyboard is good, even if it is tiny. Also, you might have a job trying to get characters on the iPhone’s keypad if you don’t have the patience of a saint. Round one to BlackBerry! You’re on the train to work when your boss emails you to tell you that your top competitor has done some major updates to their site. Frantically, you grab your phone… Which internet browser will get you the information quickest? Unless you have a touch-screen model of a Blackberry, which is rarely used in business, you’ll only get a small screen to view your data on. You will then have to navigate through with a small trackball button to both scroll and select. Also, the browser isn’t that speedy or easy to use with a tiny mouse. In contrast, the Iphone gives you a large screen which is touch sensitive and far easier to navigate – just tap, slide and pinch your way there! Also, it tends to be quicker to load than any BlackBerry browser. Round 2 to the IPhone! No one wants to have to worry about losing juice on their phone, no matter how much they use it. BlackBerrys generally have excellent battery life – you can usually go around 2 to 4 days between charging it, depending on the amount of activity you use it for. Also, you can always carry around a spare charged battery and just pop the dead one out when you need to. IPhones, however, need a good charge every evening, and I’d worry about it cutting out midway through the day if I didn’t have a charger to hand. Also, the battery is built in to the phone, so there’s no way to just stick a new one in if you run out of power. Not convenient if you travel a lot! Round 3 to BlackBerry! So, there you have it, BlackBerry triumphs again. Simply speaking, where the iPhone’s touchscreen is brilliant, its lack of physical keyboard and battery life lets it down as a business phone. BlackBerrys are dependable and are the easiest to send emails on, which is presumably what you’d be doing most of the time. 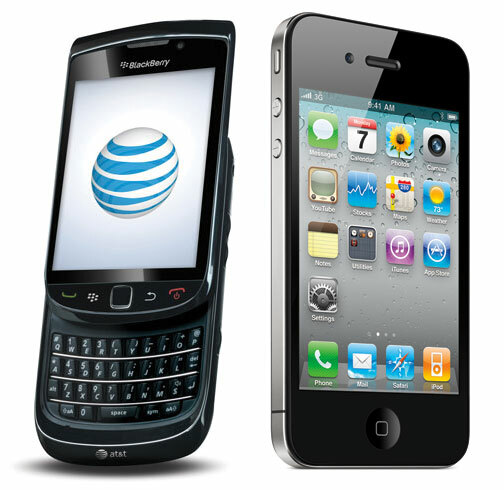 iPhones are without a doubt the best recreation phone in the business with their browsing power and app store, but personally, I would chose a BlackBerry Torch for business – this way you get the best of both worlds: large touchscreen and qwerty keyboard.